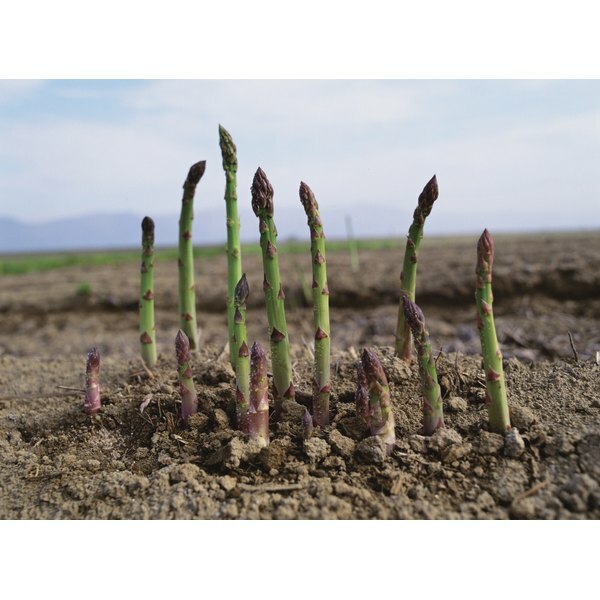 Asparagus provides substantial amounts of vitamins A and C and large amounts of folate and fiber. Pressure cooking helps preserve these nutrients and the vegetable's attractive, bright-green color. It takes very little time to cook asparagus spears in a pressure cooker: usually no more than 4 or 5 minutes. Prepared correctly, asparagus cooked in a pressure cooker should be tender from top to bottom, with no raw aftertaste. Wash the asparagus spears under cool running water. Trim 1 inch from the stem end of each spear, and discard the ends. Peel the outer layer from 1 to 2 inches of the remaining stem end with a vegetable peeler to increase tenderness. Place the asparagus spears flat in the bottom of a pressure cooker. Pour in ½ cup of water, lock the lid in place and bring the cooker to full pressure over high heat, about 2 to 3 minutes. Remove the pressure cooker from the heat immediately after it reaches full pressure. Allow the cooker to stand for 2 minutes to finish cooking. Release any remaining pressure in the cooker by gently opening the pressure release valve, making sure it's pointed away from your face. Remove the lid and let the cooker sit for another 2 minutes, or until all the steam subsides. Transfer the asparagus spears to a serving platter. Drizzle with olive oil or melted butter if desired. Sprinkle with salt and pepper to taste, and serve immediately while warm. Refer to your pressure cooker's manual for instructions on gauging pressure. Each model is different, but most types have a regulator to let you know when full pressure is reached. In most cases, the pressure regulator should maintain a slow, steady rocking motion before cooking time begins. If you have an older pressure cooker that does not have a pressure release valve, you can quickly reduce the pressure inside the cooker by running cold water over the lid for 1 to 2 minutes. Avoid letting the water run over the regulator valve, however. Using a pressure cooker with a clogged vent pipe can cause injury. Presto Industries, a manufacturer of pressure cookers, recommends holding the lid of your cooker up to the light and looking through the vent pipe before using to make sure it is unclogged and open. Hot steam released from a pressure cooker can cause injury. When removing the lid from your cooker, always open it away from your face and stand back as far as possible.